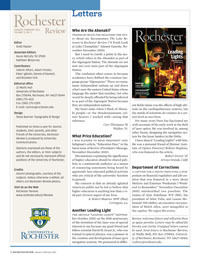 Thanks so much for including the story about my documentary The Lake Between in Rochester Review (“A Fresh Look at Lake Champlain,” Alumni Gazette, November-December 2010). But I need to clarify a point in the story, which refers to the Abenakis as part of the Algonquin Nation. The Abenaki are not now nor ever were part of the Algonquin Nation. The confusion often comes in because academics have dubbed the common language group “Algonquian.” There are many, many independent nations up and down what’s now the eastern United States whose language fits under that moniker, but who would be deeply offended by being referred to as part of the Algonquin Nation because they are independent nations. My heart sinks when I think of Abenaki people—or the Haudenausaunee culture bearers I worked with—seeing that reference. I was pleased to read President Joel Seligman’s article, “Education Pays,” in the latest issue of Review (President’s Message, November-December 2010). His summary explaining the significance of higher education should be shared publicly to a nationwide audience as a means of countering statements being heard by apparently less-educated political activists who are critical of the university function in general. My concern is that an already agitated American public not be led to believe that higher education is anything less than a vital part of every aspect of our lives. The article “Leading Lights” (September-October 2010) on the 50th anniversary of the invention of the laser was of special interest to me because my good friend and fellow scientist David M. Grant Jr., who was trained in optical physics, was a pioneer in the creation and development of laser gyro navigation systems. We pioneered in different fields (mine was the effects of high altitude on the cardiopulmonary system), but the minds of scientists do connect at a certain level as ours have. For many years Dave has fascinated me with accounts of his early work in the field of laser optics. He was involved in, among other facets, designing the navigation system for the lunar landers in the 1960s. I have shared “Leading Lights” with him. He was a personal friend of [former Institute of Optics Director] Robert Hopkins, who was featured in the article. A caption for a photo depicting a symposium on financial regulation and job creation that was featured in a story about Meliora and Eastman Weekends (“Weekend to Remember,” November-December 2010) misidentified two panelists. The names of Alan Zekelman ’87S (MS), the president of Atlas Tube, and Louise McDonald ’99S (MBA), an executive vice president of Welch Allyn, were misspelled in the caption. We regret the errors.